Tutubi spent his Holy Week break not on the crowded beaches or some secluded place but in his hometown, Paete in Laguna. He reached home by braving a 4.5 hour drive with heavy traffic typical of long weekends and holidays. palms are carried to church particularly the palaspas (made from nipa fronds) to celebrate the entry of Jesus into Jerusalem mounted on a donkey. A unique ritual of bathing the mahal na Senor (as what the dead Christ is called) is performed at the home of the owners here. 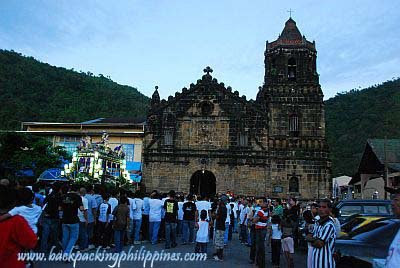 A popular holy week destination for Metro Manilans, Paete town in Laguna boasts of a traditional life-size images on processions starting on Holy Wednesday where the unique moving saints of Paete re-enact biblical events called salubong at three places in town: at the public market, Plaza Edesan and ending at the town plaza. 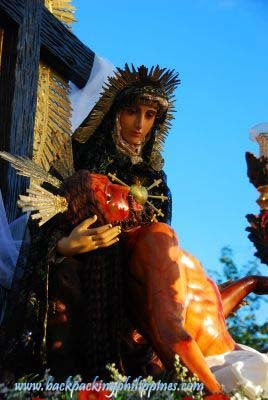 The salubong at the palengke (market) is about Mary wiping the blood and sweat of Jesus carrying the cross with operatic voices on the background. The next scene at Plaza Edesan involve Veronica wiping the face of Jesus while the last scene at the town plaza shows the moving Veronica showing her towel's imprinted with Jesus' three faces and Mary's showing her own towel with facial markings. Procession starts after mass at Paete Catholic Church around 6pm. 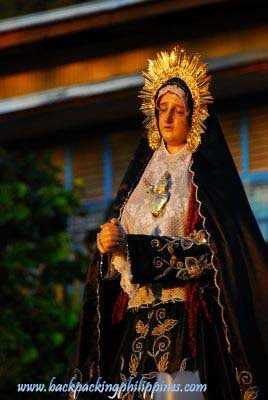 At 6pm, another procession will start, this time by IFI (Iglesia Filipina Independiente) popularly known as Aglipayan or simply Aglipay, with their own life-sized images and salubong. Note the santos are lined up for viewing on Quesada St. (Paete's Main road cutting across the town plaza) and photo opportunity. The various carriages with santos start to assemble inside the church. Those who joined the Wednesday procession got new wardrobes and flowers. The Seven Last Words are recited until 3pm when Dapit starts, the body of the dead Christ is brought to church. Procession will start at 5pm with both Catholics and Aglipayan taking different routes. The procession route will snake its way to pass by the homes of owners of santos who joined the procession of Holy Wednesday where the images are displayed. You'll notice the Tatlong Krus on Humarap (the hill overlooking Paete, part of Sierra Madre) are lighted with people visible if you have a telescope, binoculars or a telephoto lens. 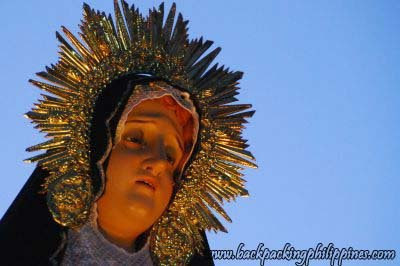 The Salubong with a re-enactment of the resurrected Jesus' meeting with his disciples starting with Mary Magdalene at dawn that includes a procession early in the morning. If you're looking for macabre and much hyped about crucifixions, you may try to view the bloody event in San Pedro Cutud, San Fernando, Pampanga where people volunteer themselves to be crucified under the searing heat of the summer sun for decades now. 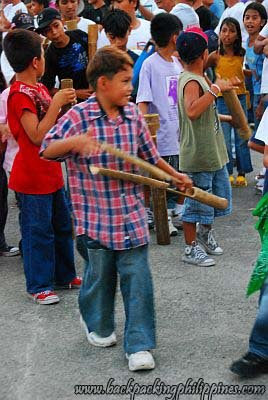 Other unique celebration on Easter Sunday are the so called Sugat (Cebuano word for meeting) dawn plays in Minglanilla and Argao towns of Cebu. The best place to be in Holy Week, for some, is just to stay at home. Imagine Metro Manila without the crowds, malls closed but Manila Ocean Park is open. I'm so sorry for your braving the 4.5 hours of travel to Laguna during the holy week. That was the reason I just settled with a few companions to La Mesa Eco Park last holy week instead of going to the hot spring just like what I did last year. wow! namasyal ka na naman. very well spent holy week! That church is pretty impressive! 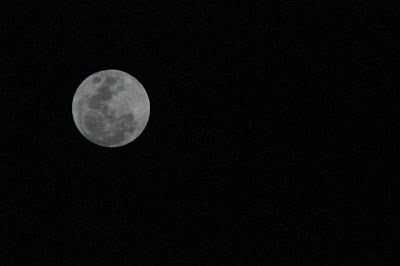 I like the shot of the moon as well! 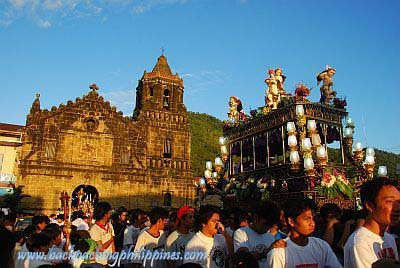 For sure I will return to Paete during Holy Week. I missed almost all activities there! Shame on me! But then there is so much to do during Holy Week! I am planning go to Pakil for the Turumba this coming Wednesday. I might pass by Paete in the morning. Not yet 100% sure if i will be able to get there since I am supposed to attend some meetings in Mnl that day. what's the significance of making noise with the bamboo clappers?